Assuming you haven’t left the handbrake on, stop your vehicle when it’s safe and contact the manufacturer or dealer. Any fault with the brakes, brake fluid level or the related driving aids such as anti-lock brakes (ABS) and stability control (ESP) could be dangerous. This could indicate that there is insufficient coolant fluid in the radiator, or that some sort of blockage or system malfunction has occurred, causing the temperature to rise. Stop the vehicle when safe and contact the manufacturer or dealer. Do not open the coolant bottle beneath the bonnet when the engine is hot as you may scald yourself. Pull over and check the engine’s oil level. If you are not familiar with the car, read the vehicle handbook for instructions on how to do this. The majority of cars have the good old-fashioned dipstick; some modern motors have electronic equivalents. Low levels of oil will urgently need topping up. Failure to do so could result in serious engine damage. There may be a failure of the power-assisted steering. It is possible to continue your journey, but exercise caution and have the system checked as soon as possible. The steering may feel perfectly alright when you’re travelling at any speed but when you slow down it may feel very heavy and some drivers won’t be able to turn the wheel. If there is a fault with an airbag, it may not work in an accident or, worse still, could deploy unexpectedly. Equally many cars have seatbelts that use pyrotechnics to pull you into the seat in an accident and these can malfunction. Head for the nearest qualified servicing workshop. This probably means the battery is no longer being charged. Switch off all unnecessary electrical items (such as the air conditioning or sound system) and take the car to be checked. If it shows a yellow symbol, it suggests the charge level of the battery is very low, and should be investigated further. A yellow symbol for the steering lock may simply be there to remind you that the steering lock system is engaged before you can start the engine. However, if it’s red and you’re driving, there is a malfunction. Ideally, do not switch off the engine (as it could prevent you from restarting the car) and drive to your nearest garage to have it checked. When driving, this can show in amber or red, depending on the severity of the fault with the ignition switch system. Although the car may not be displaying any signs of impending failure you should have it examined further. Modern cars are multiple computers on wheels and their electronic systems are designed to self-diagnose some problems before the driver notices them. This could flash or be permanently switched on. It suggests a fault with the engine or the engine’s associated operating software, known as the ECU. You can sometimes reset it, as you would a computer by switching the car off and back on again. If the light doesn’t extinguish after this, consult your garage. A diesel particulate filter is fitted to modern diesel engines to trap sooty exhaust emissions. Depending on how the car is used, it may be necessary to take an extended drive to ‘burn off’ these particles, effectively cleaning the filter. Your vehicle’s handbook will explain how to do this. It is not uncommon for a diesel glow plug to wear out. This will cause starting problems with the engine. The symbol will alert the driver to any problems – which can be rectified easily and inexpensively by most garages. Even if only one glow plug has failed, it’s probably best to have them all (one per cylinder) replaced for peace of mind. If your car has tyre pressure monitoring, it will signal only when one tyre falls to a significantly lower pressure than the other three tyres. (If all tyres gradually lose air over an extended period of time, it may not alert the driver.) If you see this symbol, check all tyres’ air pressure as soon as possible. This is no substitute to checking tyre pressures on a regular basis. I run a dual fuel vehicle. Petrol/LPG in a Freelander V6 reg 51. The engine management light is usually on most of the time if I’m doing short journeys. If I’m running the car for several hours the light will go out. I can restart, it comes on momentarily or not, until left until the engine cools down, I’ve repeatedly been told that this is not a problem, only the fact that I’m starting on petrol and it automatically switches over to gas. I’m concerned, because the MoT is this September and if the light is on during the test, I’ve been told it’s an automatic FAIL!. Can you shed any light on this anomaly. 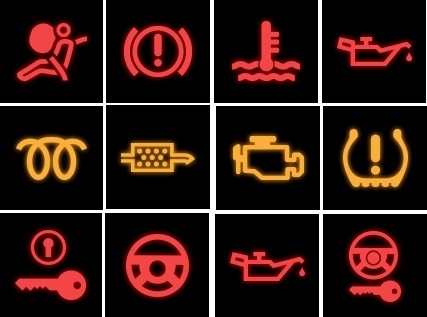 Cars can fail the MOT if warning lights are illuminated but these are safety related and to do with the ESP, ABS, SRS and so on. An engine management light on its own shouldn’t be a reason to fail a car. However, if it’s on because your car’s exhaust emissions don’t comply, it will fail the test. That said, it might simply be a sensor or similar being confused by the LPG. Depending on how well you know the garage you’re taking it to, I’d ask their opinion before you put it in for the test. So far, the tests that have been done, with the light still on, I’ve not had a fail on the exhaust emissions. The LPG system will need servicing this year, but unfortunately, the nearest garage which does maintain the unit on my car, is way out in the country (one bus an hour). I’m familiar with petrol and diesel engined cars and 2 and 4-stroke bikes, but LPG is a total mystery to me. Will keep you posted as to how things go. At least the question has been mooted and may be of some help to others. Providing the car is run for a while longer or so on petrol and they can run the examination shortly after I get to the centre, it appears to be no problem. I was told by KwikFit only on 4.6.16 that a car will not fail its MOT if engine mamagement light on.. I have this problem as well with my duel fuel jeep, my garage tells me that it the moisture in lpg upsets the sensors but it will not usually fail the mot as it is not a dangerous fault, my garage does a quick diagnostic, reset the system to make sure its nothing else they will then do the mot as usual with all the other associated safety checks. My local lpg mechanic has moved and I now have trouble getting it serviced and parts, don’t understand why there are not many around as it saves me a fortune. Is anything more needed than a quick diagnostic to determine there is nothing wrong? with a steering mechanism, that is. Kelly, it is possible to change a glow plug yourself. However, it’s not typical that the car should lose power. You’ll find a wealth of useful information on You Tube about changing the plug. However, you need to have the correct equipment and some mechanical experience. If, after watching helpful ‘How To’ guides on You Tube, you feel it’s not a task you wish to take on, your local Volkswagen dealer, or any local garage that comes recommended, will be able to take care of the job and confirm that the car is returned to full health. If it isn’t, further inspection may be required to establish the cause of the engine losing power.